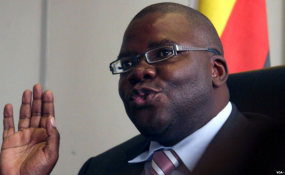 MDC-Alliance principal Mr Tendai Biti's bid to run away from justice fell through yesterday after the Zambian government denied him asylum, saying his grounds were not worth the relief he sought, and that he should return to Harare and answer to allegations in a legitimate court of law. Mr Biti is being sought by the police over a number of allegations, including inciting violence that rocked Harare after voting in the harmonised elections last week and his illegal declaration of MDC-Alliance presidential candidate Mr Nelson Chamisa as the winner. Only the Zimbabwe Electoral Commission (ZEC) is mandated by law to declare the winner of an election. Mr Biti yesterday tried to evade the police by heading to Zambia, but was taken in by the Zambian authorities while trying to cross into that country at Chirundu Border Post. In an interview with The Herald last night, Zambia's Foreign Minister Joseph Malanji said Mr Biti had come to that country to seek asylum, but his grounds were not meritorious. He said Zimbabwe's political situation was stable and there was no reason for Mr Biti to try to seek refuge in that country citing political instability. "He came here trying to seek asylum, but the grounds on which he wanted to apply for asylum did not meet the requirement as required by the law," he said. Minister Malanji said if Mr Biti was facing any charges in Zimbabwe, he had to attend to them in a legitimate court of law. "What we have done to Mr Biti is to give him safe custody before he heads back to Harare," he said. "We are simply making sure Mr Biti has a safe passage back to Harare." Asked when Mr Biti would be coming back to Harare, Minister Malanji said: "It is not up to us to tell when he's going back." By late last night, immigration sources confirmed Mr Biti had arrived at the Zambian side of the Chirundu One-Stop Border Post, while his lawyers were preparing to file an urgent High Court application to stop him from being sent back to Harare. The MDC Alliance has rejected results of the Presidential component of the harmonised elections carried out last week and incited their supporters to unleash violence in a bid to make the country ungovernable. The party, ironically accepted the results of the National Assembly and local government elections. The MDC Alliance said it was preparing to approach the Constitutional Court to contest the presidential election results. Last week, Mr Biti declared that Mr Nelson Chamisa had won the presidential elections before the electoral body officially announced the winner. He is at the centre of violent demonstrations that rocked Harare last week. Police are looking for Mr Biti and the party's organising secretary Mr Morgen Komichi to interview them in connection with the violent protests. The violent protest claimed six lives, while several others were injured when MDC-Alliance supporters went on a rampage destroying property. They also burnt vehicles, stoned shops, blocked roads and attacked people going about their business in Harare's central business district. After the violence, President Emmerson Mnangagwa said the MDC-Alliance should be held accountable for the violence. He said the party leadership should be held responsible for the loss of lives and destruction of property that could have happened. Mr Biti's conduct of inciting violence got a round of condemnation in the country and the region for issuing inflammatory and reckless statements. A report recently released by the Zimbabwe Peace Project ranked MDC Alliance as the most violent party for the month of June after it recorded 16 cases of intra-party violence.